This is the third part of a three-part series of reports on the Southeast Asia-Western Europe market. The first part analysed the position of Southeast Asian carriers as Philippine Airlines (PAL) and Garuda Indonesia prepare to join four peers in operating non-stop flights to Europe. The second part analysed the position of European carriers and the impact of Norwegian’s entrance. This part looks at the Gulf carriers, which continue to rapidly expand in Southeast Asia and pursue a larger chunk of the Southeast Asia-Europe market. Over the last two years the three major Gulf carriers have expanded their operations in Southeast Asia by more than 50%. Assuming at least one third of their Southeast Asian passengers are heading or originating in Western Europe, Gulf carriers now carry more passengers between the two regions than their European competitors. 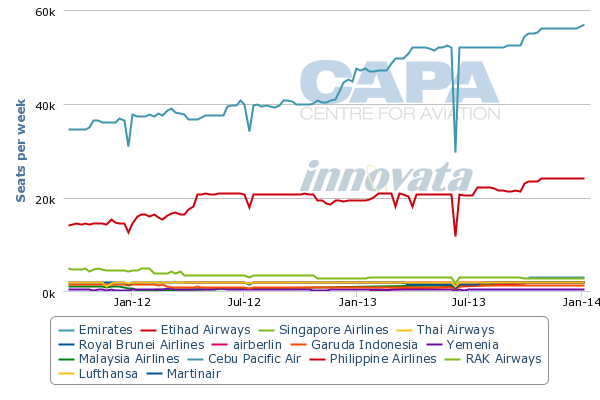 Emirates, Etihad and Qatar Airways currently provide about 210,000 non-stop weekly seats to and from Southeast Asia, according to CAPA and Innovata data. This will increase to almost 230,000 weekly seats by early Nov-2013, which marks the start of the northern hemisphere winter season – a peak travel period for Europeans seeking to holiday in the warm climes of Southeast Asia. The Nov-2013 figure represents a 37% year-on-year increase and a 54% increase over the capacity provided by the trio between their hubs and Southeast Asian destinations in Nov-2011. Emirates remains the market leader, adding about 39,000 non-stop seats between Dubai and ASEAN from Nov-2011 to Nov-2013, resulting in growth of 54%. Etihad has grown capacity between Abu Dhabi and Southeast Asia at a faster clip, by 65%, as it has added about 19,000 weekly seats. 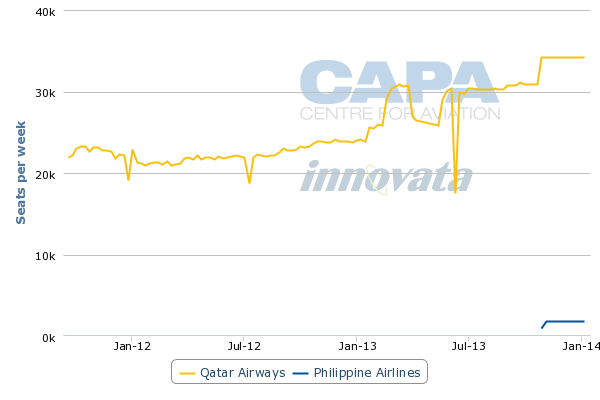 Qatar Airways will record the largest increase from Nov-2012 to Nov-2013, increasing capacity between Doha and Southeast Asia by 43% year-on-year, as it has added over 20,000 seats. Over the two-year period Qatar has grown in Southeast Asia by nearly 50%. The capacity increases have come at a time when Southeast Asia’s major flag carriers have slowed down expansion of their long-haul networks to focus more on flights within the Asia-Pacific region, where demand has remained strong. Thai Airways, the largest carrier between Southeast Asia and Western Europe will provide about 64,400 weekly non-stop seats in the market in Nov-2013, which represents only about a 5% increase compared to Nov-2011. Singapore Airlines (SIA), which is slightly smaller than Thai in the Western European market, has only increased capacity by approximately 13% over the same time period, while much smaller Malaysia Airlines (MAS) has grown by about 12%. Europe’s major carriers also have not been pursuing rapid growth in Southeast Asia in recent years. The largest European carrier in Southeast Asia, KLM, will provide about 15,600 weekly non-stop seats in the Southeast Asia-Western Europe market in Nov-2013, representing about a 3% decrease compared to Nov-2011. Lufthansa has reduced non-stop capacity by a much sharper 27% over this time period to about 11,600 weekly seats. British Airways has also reduced non-stop capacity to Southeast Asia by about 8% over the last two years. Of the major European carriers, only Air France has grown its non-stop capacity to Southeast Asia, recording about 14% growth from Nov-2011 to Nov-2013. Among the smaller European carriers, SWISS has expanded from a smaller base while Austrian and Finnair capacity levels have been relatively flat. There is still some growth in the Southeast Asia-Western Europe non-stop market as a result of new entrants, particularly Garuda, PAL and Norwegian. But these carriers are providing a relatively small amount of capacity and will need to overcome stiff competition from the incumbents. Asian carriers will provide about 182,500 weekly non-stop seats between Southeast Asia and Europe in Nov-2013, an increase of about 3% compared to current capacity levels driven by the launch of Jakarta-London flights by Garuda. European carriers will provide about 76,400 weekly seats, an increase of about 2% compared to current levels. In comparison, the three main Gulf carriers are scheduled to add nearly 20,000 seats between the Middle East and Southeast Asia over the next three months, representing an increase of 9% compared to current levels. Eight other Middle Eastern carriers also serve Southeast Asia but they collectively only provide about 42,000 weekly seats in the market, have not been expanding and do not generally pursue sixth freedom passengers, which account for the overwhelming majority of traffic at Emirates, Etihad and Qatar. The rapid rise of Emirates, Etihad and Qatar has put significant pressure in recent years on the established players in the Southeast Asia-Western Europe market and will similarly make it challenging for any new entrant from Asia or Europe. In just two years, the trio have added about 80,000 seats between the Middle East and Southeast Asia, which are more seats than the total number of seats provided in Southeast Asia by all Western European carriers combined. Not all of the three Gulf carriers’ roughly nine million annual Southeast Asian passengers are heading to and from Western Europe as the carriers also connect Southeast Asia with the Middle East, Africa, Eastern Europe and parts of the Americas. But Western Europe is a huge part of the Emirates, Etihad and Qatar networks and Western Europe is a much bigger market for Southeast Asia than any of the other regions. Western Europe currently accounts for 24% of total seat capacity at Emirates, 21% at Etihad and 20% at Qatar, according to CAPA and Innovata data. Southeast Asia accounts for 11% of total capacity at Emirates, 16% at Etihad and 14% at Qatar. The relatively bigger emphasis on Western Europe is logical as Southeast Asia is a smaller market and the Gulf carriers also carry a large number of passengers between Western Europe and North Asia. Emirates, Etihad and Qatar currently account for about 5% of total international seats in Southeast Asia and about 3% of total international seats in Western Europe. Emirates, Etihad and Qatar all have strong networks in Western Europe, which gives them a competitive advantage over their Asian competitors. While Asian and European carriers offer the convenience of non-stops in the Southeast Asia-Western European market, the number of city pairs is rather limited. Market leaders Thai and SIA only serve 12 and 11 destinations in Western Europe while Emirates serves 27. Emirates is particularly strong in the UK, where it serves six airports. This has provided Emirates with a big advantage in one of the largest inbound markets from Southeast Asia as a large portion of UK passengers heading to Asia do not reside near London. Qatar has 18 destinations in Western Europe while Etihad has 11. While they do not have the networks of Emirates, both carriers have several Western European destinations which are not served by any Southeast Asian carrier. While Etihad has the smallest Western European network it has a more extensive partnership programme which gives it virtual access to more destinations, including direct links from its Abu Dhabi hub to Berlin. The Gulf carriers are also starting to differentiate themselves by serving more Southeast Asian cities that have limited or no non-stop links to Europe. Markets such Yangon in Myanmar have traditionally only been linked to Europe by Southeast Asian carriers, particularly Thai, SIA and Malaysia Airlines. But Qatar launched non-stop services in Oct-2012 from Doha to Yangon, opening up a host of new and faster one-stop connections between Myanmar and Europe. Emirates serves seven Southeast Asian destinations with an eighth, Clark in the Philippines, to be added from 1-Oct-2013. Etihad currently serves five Southeast Asian destinations with a sixth, Ho Chi Minh, to be launched on 1-Oct-2013. Emirates and Etihad serve all their Southeast Asian destinations non-stop although they operate some flights which continue beyond Southeast Asia to Australia. Following Etihad’s upcoming launch of services to Vietnam, all three of the big Gulf carriers will serve the six main Southeast Asian markets of Bangkok, Ho Chi Minh, Jakarta, Kuala Lumpur, Manila and Singapore. They compete with non-stop operators in Bangkok, Kuala Lumpur, Singapore and Ho Chi Minh but are able to leverage their extensive Western European networks to offer a larger array of destinations from these four markets compared to their Asian or European competitors. They are also able to effectively compete in some of the largest city pairs such as Singapore-London, where there are now only two non-stop carriers, as SIA and BA are not able to accommodate the entire market (partially because SIA allocates a majority of its London capacity to sixth freedom passengers while one of BA’s two Singapore flights continues to Sydney). Emirates, Etihad and Qatar have particularly strong positions in Jakarta and Manila as these markets do not currently have any non-stop flights to Europe. This will change as Garuda and PAL launch non-stop flights to Europe. But Garuda and PAL will not be able to come close to matching the huge array of European destinations provided by the Gulf carriers. Garuda has a close partnership with Etihad while PAL has a more limited codeshare with Emirates, Etihad and Qatar. Garuda and PAL will need to maintain and grow these partnerships in order to cover the large portions of Europe they will not serve with their own aircraft. Most of the huge capacity increases recorded by the major Gulf carriers in Southeast Asia over the last two years has been driven by continuing expansion in the main markets. Capacity has been added by all three carriers to Bangkok, Manila, Kuala Lumpur, Jakarta and Singapore. 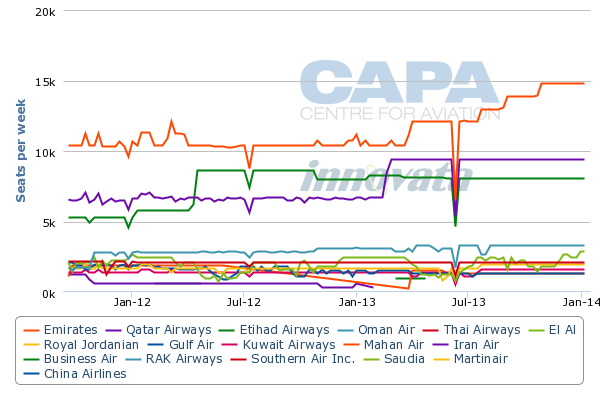 Ho Chi Minh also has seen growth as Emirates entered in Jul-2012 with Etihad to follow in Oct-2013. Bangkok, which is by far the largest Southeast Asian market for Gulf carriers, has particularly seen a big increase in capacity. Emirates will have almost 15,000 non-stop one-way seats from Dubai to Bangkok in Nov-2013, representing a 43% increase compared to Nov-2011. Qatar has increased capacity by about 47% over the same period while Etihad has increased capacity by 51%, according to CAPA and Innovata data. Emirates currently operates five daily flights from Dubai to Bangkok, including one with A380s (a second frequency will be up-gauged to the A380 in Oct-2013). One flight continues onto Hong Kong and another flight continues onto Sydney. Qatar currently operates four daily flights from Doha to Bangkok with one continuing onto Hanoi. Etihad operates three daily flights from Abu Dhabi to Bangkok. The Gulf carriers have discovered there is almost unlimited demand for flights to Bangkok, at least if fares are priced relatively low as it is a leisure-focused market. Bangkok and Thailand overall is a huge destination for holiday goers from throughout the Middle East and Europe. It is no coincidence that Emirates and Etihad are the two largest interline/codeshare partners for Thai regional carrier Bangkok Airways, which provides connections from Bangkok Suvarnabhumi to domestic and short-haul international destinations which the Gulf carriers generally do not serve with their own aircraft. Qatar is generally the only Gulf carrier operating into the smaller Southeast Asian destinations. While the carrier also continues to add capacity to the main Southeast Asian cities, it is confident it can eventually upgrade the four destinations it now serves on a one-stop basis to non-stop. In the meantime Qatar benefits from pick-up rights on all four of its tag routes in Southeast Asia, which help make the flights viable until there is sufficient demand to support non-stop flights from Doha. Of Qatar’s four one-stop destinations in Southeast Asia, only Phuket is served by another Gulf carrier. Emirates launched services from Dubai to Phuket in Dec-2012, just over one year after Qatar Airways began serving the popular Thai leisure destination via Kuala Lumpur. As the Gulf carriers continue to expand in Southeast Asia – with a combination of capacity increases to existing destinations and new routes – their share of Southeast Asia-Western Europe market will grow further. While the total size of the market has been growing, it is not expanding at nearly the pace that the main Gulf carriers are pouring in additional capacity. Inevitably this will result in even more competitive pressure on Southeast Asian and Western European carriers – both the incumbents and the new entrants.